It had to happen eventually. I have never been under any illusion that the Robomower would be, in fact, a a maintenance-free device. With all the rattling and shaking going on, something was bound to come loose. Just as I might have suspected, the first part to go was what I had always considered a temporary part anyway: the bottom of one of the mower deck hangers, which was a 12″ length of threaded rod. The bottom of the hanger was just a 1/4-20 nut and a washer, which wasn’t really firmly attached. I think the fix will be some epoxy (JB-Weld) on a new nut. The ideal part would be a 12″ 1/4-20 carriage bolt, but I don’t really think I’ll be able to find that at the hardware store, so I’ll just go back to attaching a nut. The second part to go was also sort of expected. My neighbor’s lawn grows a lot faster than mine does (due mainly to his landlord’s obsessive fertilizing), and when my neighbor and I were both mowing our respective lawns at the same time, we both were excited to see how the Robomower would work on a shaggier turf. The mower was set for something like a crew-cut length, and the lawn across the street was definitely looking kinda Beatlemania. So the question was, how would the bot deal with a heavier load, and how would it’s mulching abilities fare under the circumstances? – At full speed, in tall grass, the mulching ability of the Robomower is somewhat compromised. – At full speed, in tall grass, the mower motor will, in fact, draw more than 30 amps at 24 volts. 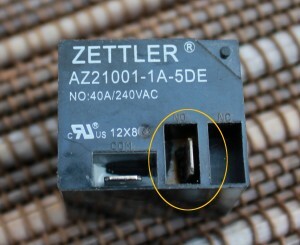 – The relay that controls the power to the mower motor is rated at 30 amps at 24 volts. This rating is apparently accurate. – In tall grass, when the relay fails, it fails closed, so the mower motor stays on. Those who have been following this project from the beginning may recall that when I went looking for a relay that used a 5-volt coil and could handle high amperage at 24 volts across the contacts, I was able to find them inexpensively, but with a relatively large minimum order. So I basically ended up investing around $30.00 including shipping for a part that actually cost a little less than $2.00. The good news is, I ended up with about 15 spares. The rest of the good news is that replacing the relay took about 25 minutes, including time spent waiting for the soldering iron to heat up, and searching for my roll of solder. Unfortunately, that’s also about how long it took for my neighbor to fire up his gas mower and fix his lawn. So no pictures of the reverse Mow-Hawk, and no further data collection that day. We’ll try again next week, I’m sure! The burned-out relay. The circle shows where the current melted the plastic near oneof the contacts. – Mow the lawn in a couple of passes, each progressively closer. This increases the time spent having fun with the Robomower, and reduces the stress on all the components. I did build height adjustment into the thing, after all. – Insert a fuse and fuse holder between the BOS and the relay contacts to protect the relay from the over-current condition that I have empirically determined to be present from time to time. I’m thinking 25 amps ought to do the trick. In other news, the Robomower is famous! Actually most of you reading this probably learned about this site from reading the email that I sent to Make Magazine right after I made the first successful functional tests of the Robomower. I had so much fun building this thing, that I really felt it would be appropriate to broadcast some thanks to the people who provided so much inspiration and information. I am proud and grateful that Mark Frauenfelder and the rest of the editorial staff liked my email and picture, so thanks again to them! 1 comment to Robomower part 12 – Things start breaking, and I’m famous! Hi, I had a very similar epiphany upon first seeing the original lawnbot, and went a slightly different path than you or JD. Like you, I went with the sabretooth 2×25 after pricing components to make the triple 8 board. I welded up a frame from scrap metal, and have never installed the mower because im just having too much fun simply driving it around. I used a 2.4g wireless setup I got from hobbypartz.com for $32. Programming is pretty new to me, and I don’t understand the need for interrupts. I wrote my program to run through the arduino and convert to PWM, and use the sabretooth with switch 4 set for analog mode and a resistor/capacitor bridge to smooth the signal (check sabretooth data sheet for schematic.) My bot runs fine without interrupts. If you for 2.4g and user reboticon in arduino hardware forum, you will find my code posted. I used 2 currie scooter motors rated at 250w that I got for $20 each from allelectronics.com and the gears from partsforscooters mentioned in the article. I had the same speed problem you have. I found it was best to simply change the entire system to 12v. End result is full throttle is 50 percent, as if you had cut each signal by half. This is a couple months since your last update so you may have worked out your own answers, but I just wanted to share with you what I had found since I learned quite a bit from your blog.